One young man went in to apply for a managerial position at a large corporation. He passed the first interview with ease and the department director was enlisted to make the last interview. The director discovered from the resume that the youth’s academic achievements were excellent all the way from his early educational experiences to his postgraduate research project. He didn’t have a year without excellent marks. The young man felt that his chance of landing the job was high. When he went back, he sheepishly requested his mother let him wash her hands. His mother felt strange, but with mixed feelings, she showed her hands to her boy. The youth cleaned his mother’s hands slowly. Tears fell as he performed the menial task. For the first time he noticed his mother’s hands were wrinkled and covered in bruises. Some of the bruises were so tender his mother shivered when they were cleaned with water. This was the first time the young son realized it was this pair of hands that washed the clothes to enable him to pay for school. The bruises on his mother’s hands revealed the price she had paid for his graduation, academic excellence, and now his future. After he finished cleaning his mother’s hands, he promptly washed all the remaining clothes for his mother. That night mother and son talked for a long time about her work in the laundry. I know now what appreciation is. Without my mother, I would not have become the successful man you see today. By washing my mother’s hands and washing her laundry, I discovered the hard life my mother had to endure to put me through school. I now realize how difficult and tough it is to get some things done. 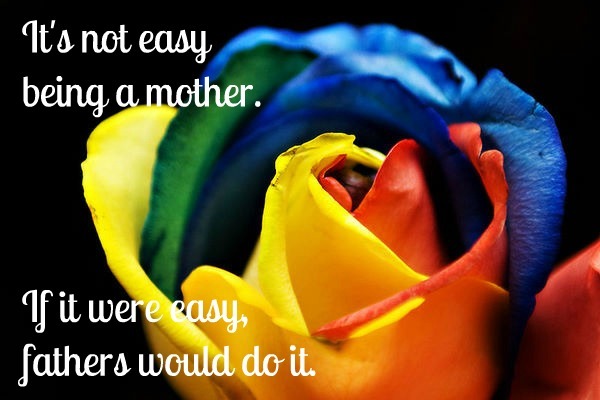 Mother’s Day is a great day to truly honor your mother. Don’t just give her a card. Look at her hands! Love on her for the sacrifice she made to afford you the opportunity to be successful in life. from Lubgbock Texas! Just wanted to tell you keep up thhe excellent work! of date rehashed information. Fantastic read! I’ve bookmarked your site and I’m including your RSS feeds to my Google account. Thanks for the encouragement. I appreciate your support…many blessings!